Between the summers of 1967 through 1969, before the term serial killer was coined, a predatory killer stalked the campuses of Eastern Michigan University and the University of Michigan seeking prey until he made the arrogant mistake of killing his last victim in the basement of his uncle's home. All-American boy John Norman Collins was arrested, tried, and convicted of the strangulation murder of Karen Sue Beineman. The other murders attributed to Collins never went to trial, with one exception, and soon became cold cases. 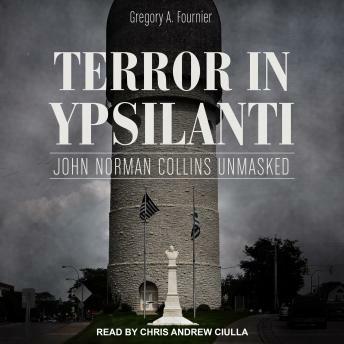 With the benefit of fifty years of hindsight, hundreds of vintage newspaper articles, thousands of police reports, and countless interviews, Terror in Ypsilanti: John Norman Collins Unmasked tells the stories of the other victims, recreates the infamous trial that took Collins off the streets, and details Collins's time spent in prison. Terror in Ypsilanti compiles an array of physical and circumstantial evidence drawing an unmistakable portrait of the sadistic murderer who slaughtered these innocent young women.